Can this rejuvenated virtual analogue synth stay relevant in today's competitive arena? Strobe is back and better than ever, with a classier sound, new effects and modulators, an improved arp and fantastic presets. Improved sound. Better interface. New preset library. It's been almost a year since we got a tantalising taster of FXpansion's updated Strobe2, and well over five years since the original hit the streets as part of DCAM Synth Squad. In the interim, FXpansion has taken the decision to dissolve the Squad and develop each synth independently. Strobe2 (VST/AU/AAX/RTAS/Standalone) is the first to arrive, with Amber and Cypher to follow, then some form of update to the Fusor host. Strobe is inspired by the classic single-oscillator synth designs (think Roland's SH-101), but it's polyphonic and features unison (32 unison voices for each main voice). The Main oscillator combines Saw and Square waveforms with level faders for each and pulse width for the latter, and includes a Stacking option with Detune, enabling up to four extra oscillators to be stacked, independent of the Unison. Sound generation is bolstered by four sub oscillators (Sine, Triangle, Saw and Square, each with its own octave setting) and a Noise generator. "At the centre of the interface is the Scope display, providing visual feedback." The signal is shaped by a single multimode filter offering 22 filter types and a Drive control; an LFO with swing and pulse width; two envelopes (Modulation and Amplitude) with tempo Sync and Loop; and a VCA with adjustable analogue colour. The TransMod system enables modulation of most parameters, and each assignment includes a secondary slot for applying a scaling modulator. Other options include an Arpeggiator and a Ramp module for delay and rise time generation. Finally, at the centre of the interface is the Scope display, providing visual feedback on the oscillator and LFO waveforms, and filter curve. In terms of layout, Strobe2 is pretty much identical to Strobe 1; but under the hood, the audio engine has been completely rebuilt. Version 1 patches you've created in Strobe's native preset format can be imported via Strobe2's Legacy tab or from your OS's browser. The new engine is far better CPU-optimised than its predecessor, and the previous extreme oversampling rates (x16 and x32) have been ditched, although oversampling is now always active (x2, x4 or x8), and the option remains to switch the rate when rendering. 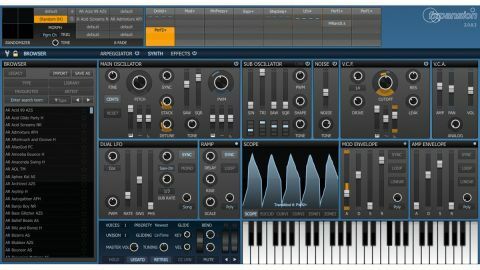 The new interface offers scale options (75- 220%), two colour Themes (light and dark), a fold-out preset Browser, plus two tabbed pages for the new Effects and upgraded Arpeggiator. Said Effects section comprises 28 processors, 19 of them lifted from Fusor (TinCan Reverb, for example), and new ones including FX-Verb (an algorithmic reverb), Pattern Delay (a multitap delay), Env Shaper, Enhancer, Nonlinear Ringmod, DirtyDAC (an old DA converter emulation) and various EQs. The effects are inserted in series in two three-slot chains, with mix blend dials for each effect and each chain. "The Filter Drive is now gain compensated and includes a Leak level control for introducing the pre-filter signal." Meanwhile, the 32-step Arpeggiator has all the typical options you'd expect, such as Swing, Gate time, Rate and Mode, as well as a modulation Step Sequencer. This last can be used in tandem with the Arpeggiator (each can reset the other) and as a TransMod source. Further new features include eight Quick Preset slots for easy access to up to eight patches, with time-variable morphing between them, freezable at any point in the morph; 16 TransMod slots, up from the previous eight; parameter locking when changing patches (including the Arpeggiator); a Randomizer with X/Y pad (morph between randomly generated variations in each corner) and its own Quick Preset slot; and three new TransMod Processors. The new arp and effects contribute immensely to Strobe2's 900-odd new patches, but there are changes to the synth itself that prove transformative, too. The sub oscillators can now match the Main oscillator octave as well as up to three octaves below (as per v1), and the Sub section as a whole can be unlinked from the main Oscillator's pitch-related parameters (Sync, Stack and Detune) - ideal when you want to retain a solid underpinning while the Main Oscillator is doing something more complex. There's also a Phase Reset option for the Main Oscillator, facilitating consistent note onset, and each oscillator section includes a Tone control, which is basically a high shelving EQ. The Filter Drive is now gain compensated and includes a Leak level control for introducing the pre-filter signal; and the LFO offers an additional sub cycle, which is a multiple of the main LFO. Finally, both Envelopes have doubled maximum time ranges (32 seconds each for Attack, Decay and Release). All of this expands Strobe2's sound capabilities considerably, and A/B-ing it with v1 reveals a much more vibrant- and expansive- sounding synth. This is particularly noticeable with pads, leads and textures, where the new effects often play a big part. Of course, the arp patches are also considerably better, with complex 32-step patterns outshining the eight- steppers of v1, although sadly the Legacy arp patches don't include the arp programming, rendering them pointless. Basses benefit, too, with more potential in the edginess department. Nevertheless, there was a certain directness of sound to the original Strobe that worked particularly well for simple basses, and that has changed. Overall, Strobe2 is a more rounded synth than v1, with a far broader feature set, a better preset library and greatly finessed sonics.